Exomine may reduce joint pain caused from arthritis and help your body naturally strengthen joint areas. 50% of all people will experience osteoarthritis by the age of 65. Osteoarthritis is the most common form of arthritis. This disease affects humans and all vertebrate animals. A strong and healthy joint is rich in glycosaminoglycans. In weak and unhealthy joints, levels of glycosaminoglycans and other key factors tend to be low. 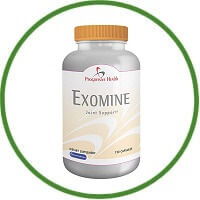 Clinical studies show that the ingredients in Exomine can help. In one study over a three month period, subjects who took the same ingredients that are in Exomine experienced a gradual reduction in joint pain and tenderness while improving flexibility and range of motion. In an eight week clinical study, the ingredients in Exomine provided more pain relief than ibuprofen with fewer side effects. Additionally, the benefits continued weeks after the study were completed indicating that tissue had been strengthened and repaired.